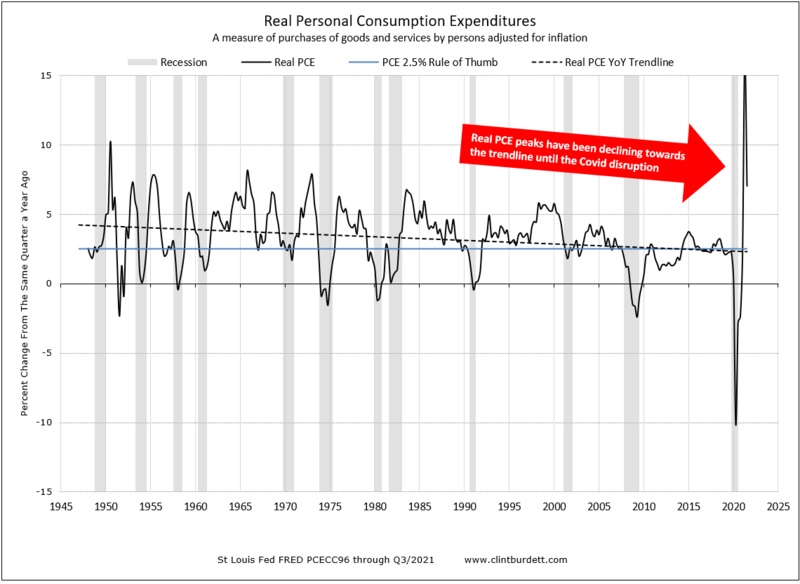 Overall: Real GDP grew in 2018 to 2.9% YoY towards its historical trendline (3.2% average since 1948), but Real Personal Consumption Expenditures (PCE), which is the core contributor of real GDP at 69.4% is trending down. 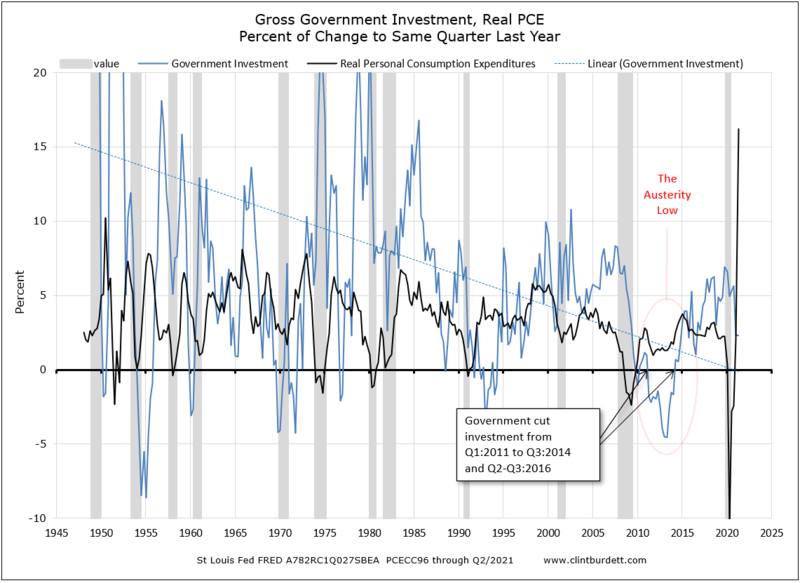 My rule of thumb to sustain Real GDP expansion at 3% or greater is that real PCE grows at least at 2.5% YoY (threshold) and increases (momentum) over two consecutive quarters. Real PCE is a measure of purchases of goods and services by persons adjusted for inflation growth from the same quarter last year, now down from 4.3% Q1 2015 to 2.2% in Q4 2018 (3rd Estimate0. This implies the expansion is losing steam but NOT contracting; modest growth could continue for several years. Real GDP growth in Q4 was about 2.6% supported by: durable goods manufacturing increasing though at a slower rate of change, new jobs and steady modest wage growth, household debt service ratio at series low. Consumers were confident in Q4. Interest rates modest. Mortgage applications are off to a strong start. Real GDP growth will face these headwinds in 2019: A perception recession is around the corner, President Trump's war with the House, trading partners, and long-term policy uncertainties, federal debt increasing, savings rate increasing (families are being more prudent) and as Real PCE Growth falls below 2.2% compared to same month last year, fall 2018 retail sales growth rate YoY declined. Inventory of new homes for sale is increasing, new starts moderating. Household debt is rising again after Great Recession deleveraging. 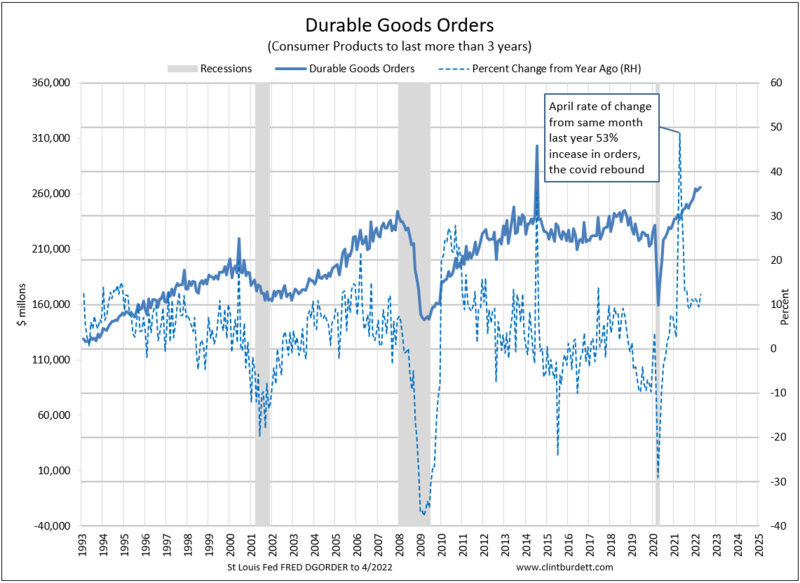 Durable Goods Inventories are building. Discretionary big ticket sales like RV, new car declining. Business borrowing interest costs increasing. And families have discovered the 2018 Tax cut's impact on there income taxes and cash flow in 2019. In 2018 real GDP's YoY growth rate peaked at 2.9% YoY, and will decline in 2019. This 100+ month expansion is long in the tooth and in 2019 national politics are having an partisan affect. Now is the time to have a plan for the downturn starting in 8-15 months to protect cash and cash flow flow. 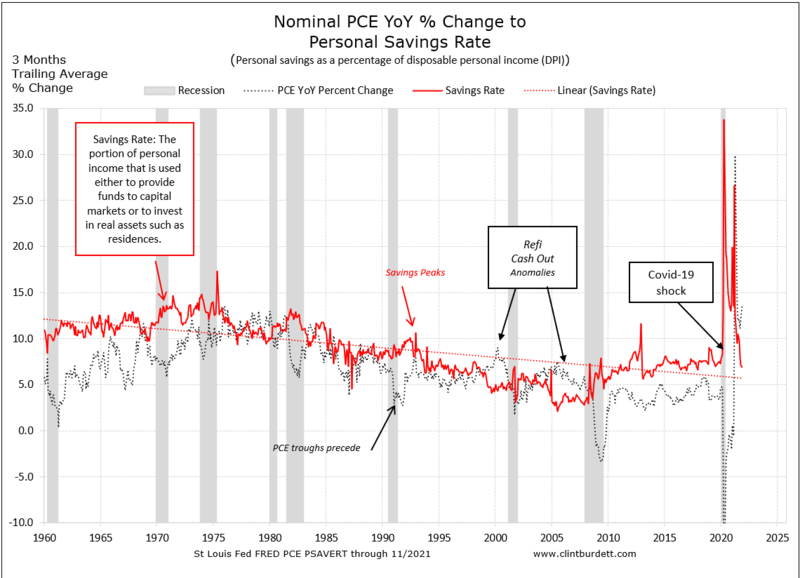 In the following charts, I use real PCE, a solid black line, unless the other data is nominal (not adjusted for inflation) where I use nominal PCE, a dotted black line. 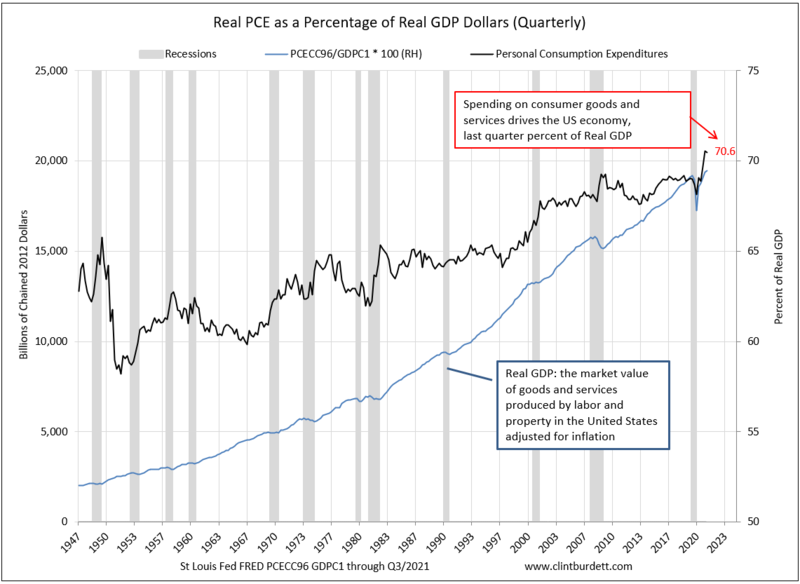 Real PCE is the largest percentage contributor to Real Gross Domestic Product. Other contributors rise and fall from effects of consumer spending. 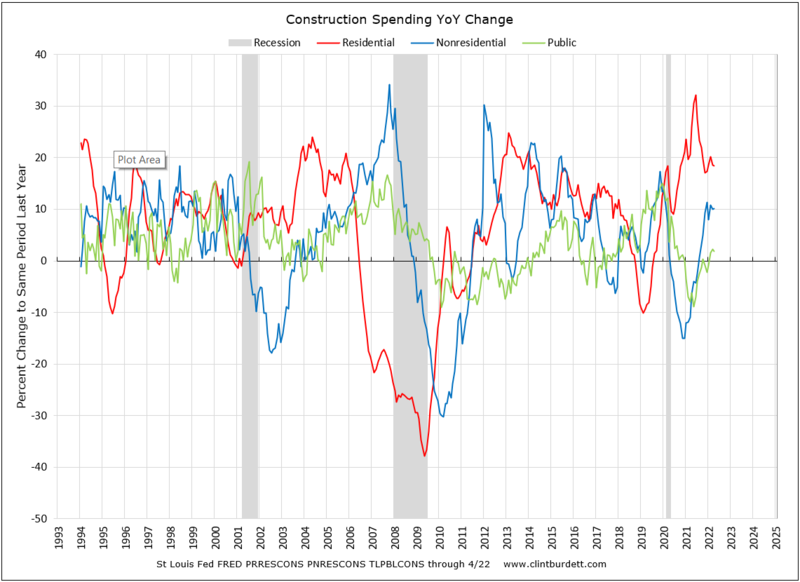 In a recession, real PCE's percentage of real GDP can increase rapidly as other contributors percentages collapse (a zero sum game), for example Residential Investment's new home construction (data since 1947). 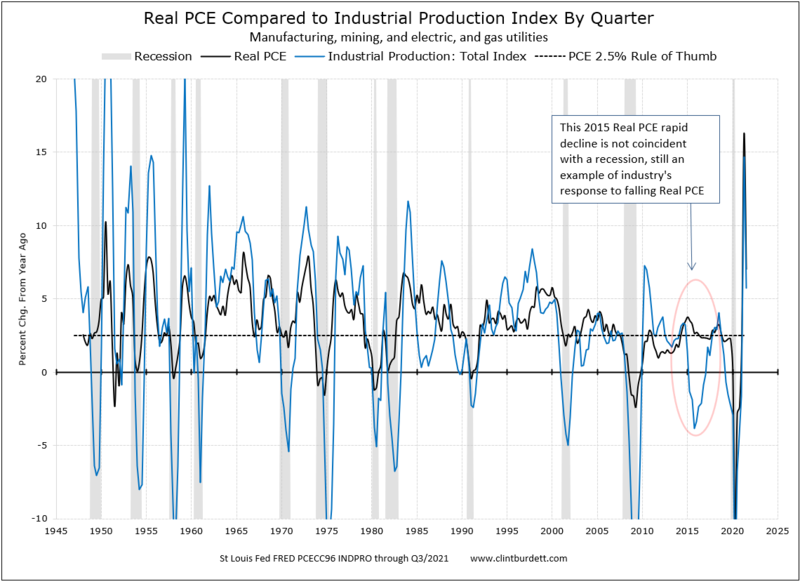 A pattern to look for is the rate of change of real PCE to the same period last year declining, a leading indicator for a recession. 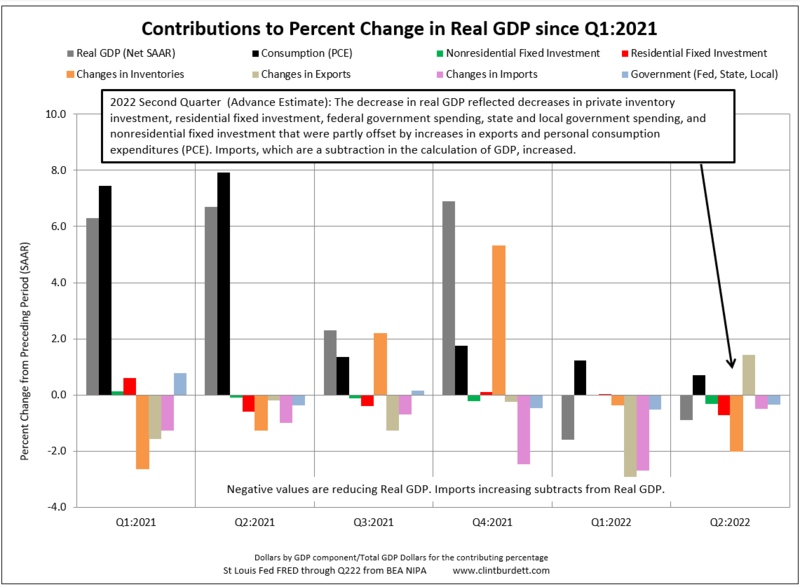 Contributions to percent change in real GDP hint the end of the expansion in the near term. Real PCE and Industrial Production Index percent change compared to the same quarter last year. Industrial production (equivalent to about 19.1% of GDP in 2017*) is increasing as consumer purchases are slowing down. *I mostly use BEA GDP data, which is persons spending and income, and does not include manufacturing spending. Here I use CIA Factbook ratios for contributions to GDP by industry, equivalent to BEA percentages. 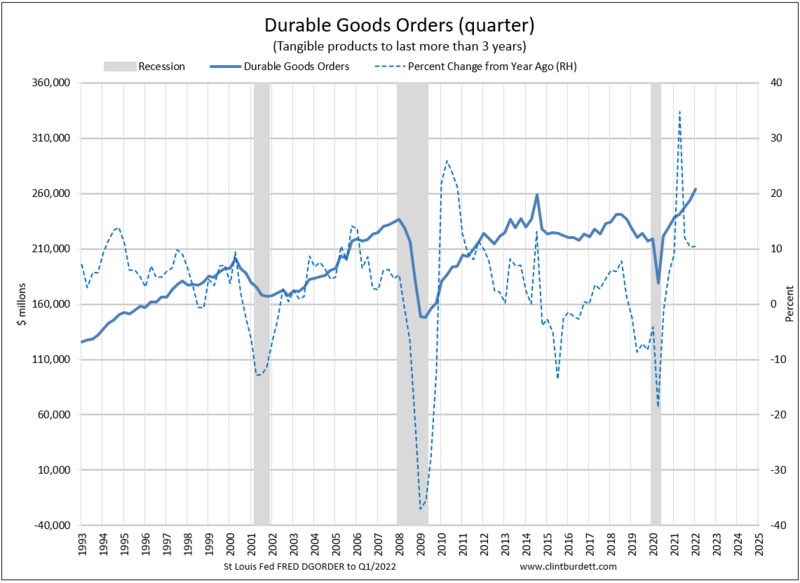 New Durable Goods Orders (9% of GDP), current rate of growth is declining late in 2018 but still positive. 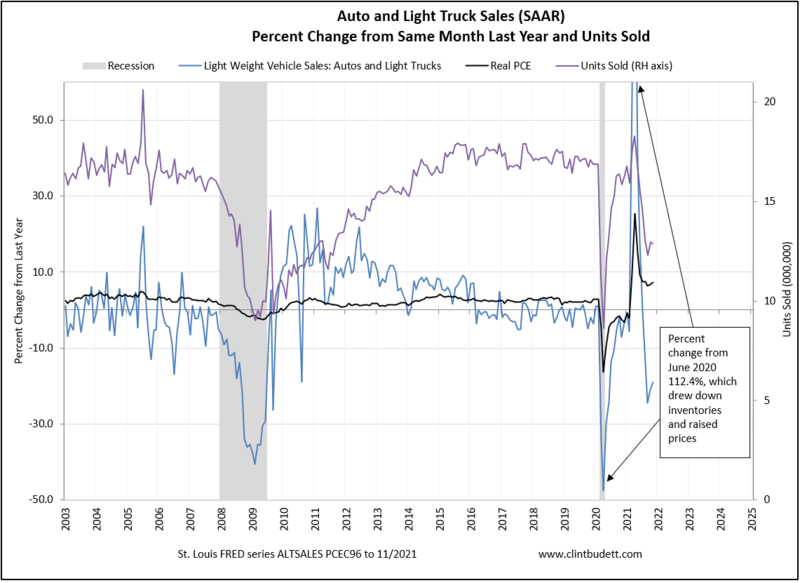 Some digressionary purchases like autos/light trucks are declining compared to the same period last year. The Durable Goods Orders to Inventories pattern, another view, shows the build up and sell off of inventories. Note durable goods sell less often, inventory builds when spending slows. Sell offs can be triggered by higher interest rates carrying costs, which can lead to or be coincident with the beginning of a recession. Overall, total private fixed investment (18% of GDP) has modest growth compared to less growth for residential investment in new homes and apartments. We are investing less in infrastructure as a percentage of GDP. 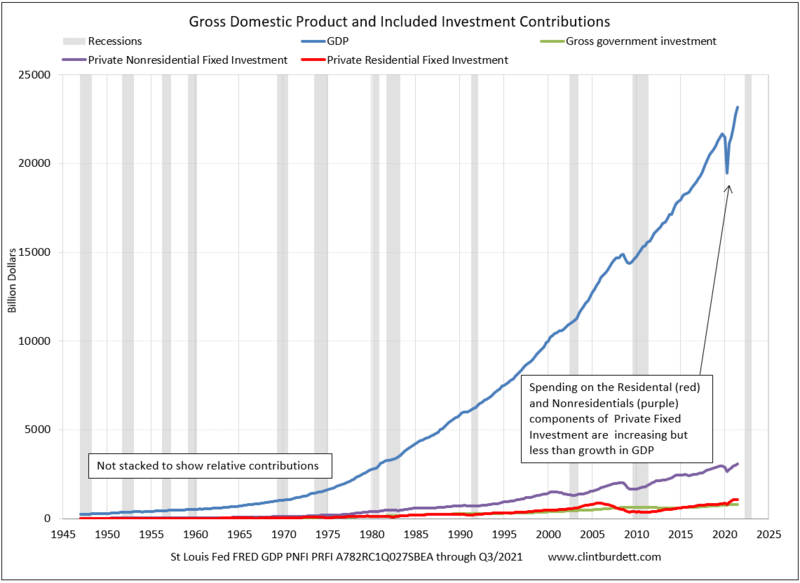 Nominal Gross Domestic Product and the included investments compared to GDP growth. Fixed Private Investment growth (1% change YoY) is not in line with nominal GDP growth (in Q4 a 2.6% change to same quarter last year SAAR), a structural issue for our competitiveness. Gross Government Investment has been volatile since the Great Recession and trending down since WWII, a structural problem where Government Investment per capita has declined dramatically. I observe that the Great Recession Recovery has had two phases: until February 2014 stabilization - austerity with very modest growth and thereafter growth similar to a normal expansion. Therefore we are about 60 months into the second phase (the average normal expansion last 65 months). How much cash can a person, families, businesses, and governments access in a downturn? Less. 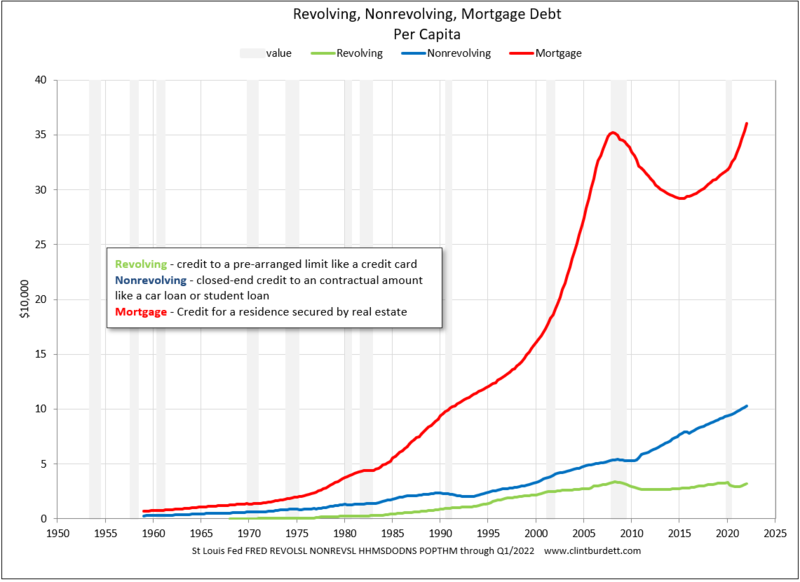 As Federal debt is growing, accelerating, personal debt has bottomed building again; credit card debt is growing; families mortgage debt is growing but foreclosures are very low and Baa business borrowing costs are increasing, delinquencies not yet. GDP, PCE, Federal Debt and Interest on the Debt Per Capita. Federal debt interest payment percentage of principle low but starting to rise. "For the moment, the US can finance its trillion-dollar deficits at relatively low cost. But the relatively short-term duration of its borrowing – under four years if one integrates the Treasury and Federal Reserve balance sheets – means that a rise in interest rates would soon cause debt service to crowd out needed expenditures in other areas." Nonfinancial Corporate Debt - The rate of change from same period last year is decreasing, businesses are borrowing less. Nonfinancial Corporate Debt as a Percentage of GDP (NSA) has peaked and is trending down. Rosenberg in Forbes is concerned refinancing at higher rates will increase commercial delinquencies in 2019 and 2020. Baa Corporate Rates (Monthly) and Delinquency Rates (Quarterly). As Baa interest rates rise, delinquencies (lagging) have not increased. FRED sources: Moody's Seasoned Baa Corporate Bond Yield [Baa], retrieved from FRED, Federal Reserve Bank of St. Louis; https://fred.stlouisfed.org/series/Baa, and Delinquency Rates for Industrial/Commercial Loans. Household Debt in dollars per capita is increasing. Household Debt Service Payments as a Percent of Disposable Personal Income is the lowest in decades. After the Great Recession, households have paid down debts. 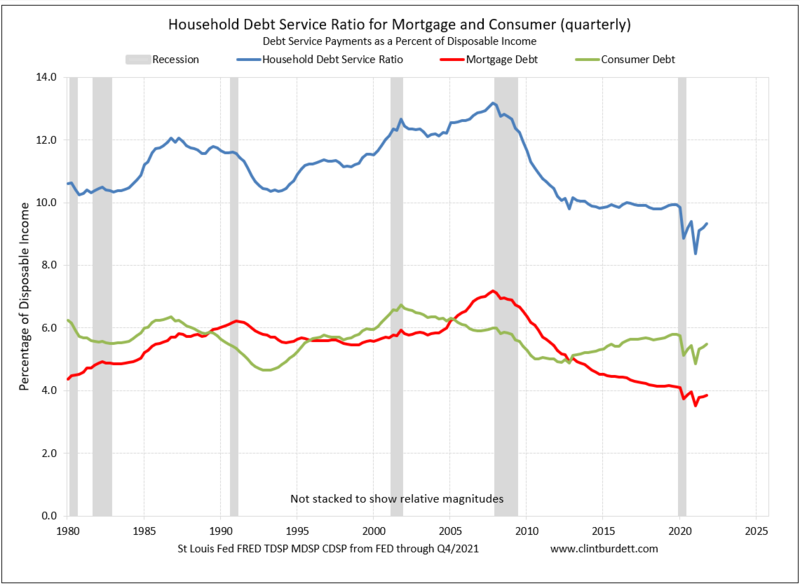 Household Debt Service Ratio (blue line) steady since 2014 as the population grows, mortgage debt falling offset by rising more expensive credit card debt. Overall household cash flow has improved significantly since the Great Recession. 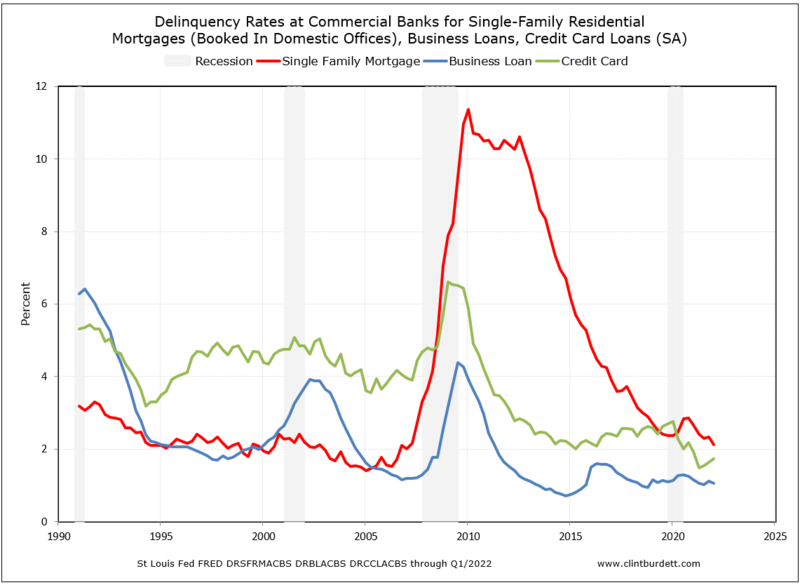 Mortgage and Business Loan delinquency rates are declining except credit cards. Mortgage delinquencies increase and accelerate entering a recession, not an issue now, very low. 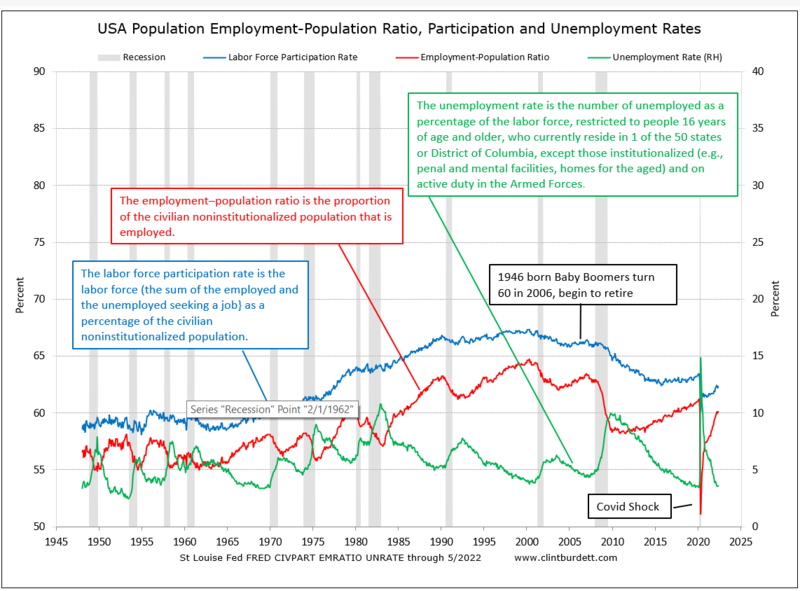 The USA is at full employment with the 26-55 cohort participation rate increasing. Job growth is slowing down, still expanding. Jobs holders are leaving their job for better opportunities. There are more job openings than unemployed. 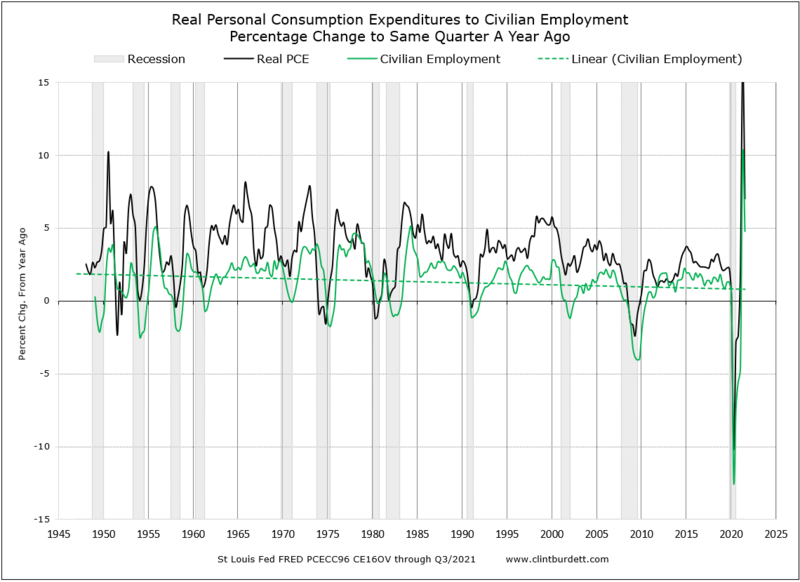 Hiring lags Personal Consumption Expenditures (PCE) spending, the PCE growth rate of change is slowing. 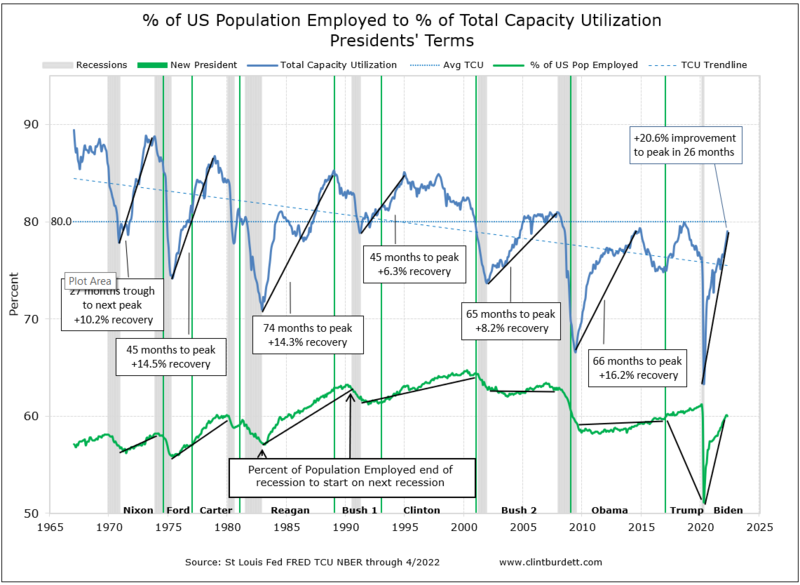 Employment compared to Capacity Utilization, which continues to decline, a structural change. Will tariffs reverse the trend is unknown. Labor Force Participation Rate USA 16 years old or older has declined as baby boomers retire but should rise soon as millennials enter the work force. 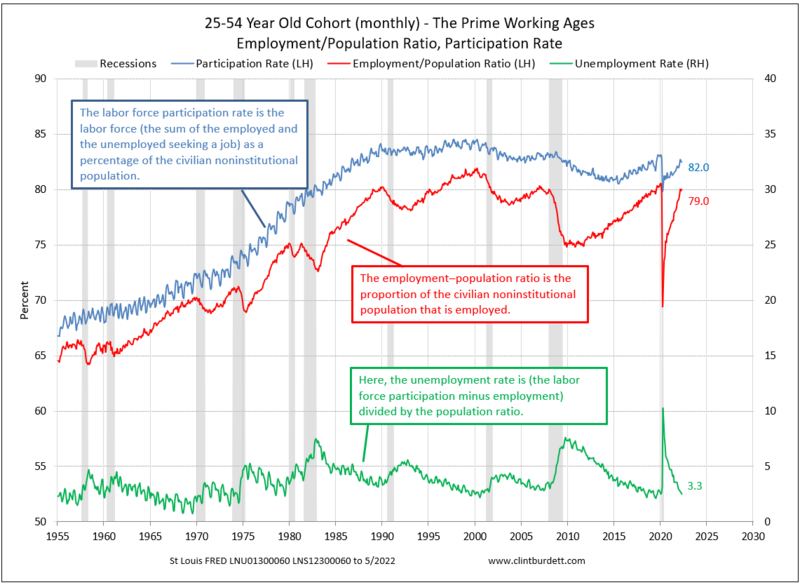 Participation Rate 25-54 Year Olds (prime working years cohort) is improving as younger people get jobs. For Real GDP grow at 3.0% or greater at a Seasonal Adjusted Annual Rate, individuals must continue join the work force. When employment approaches full employment, there are fewer individuals to join the workforce and Real PCE growth declines. 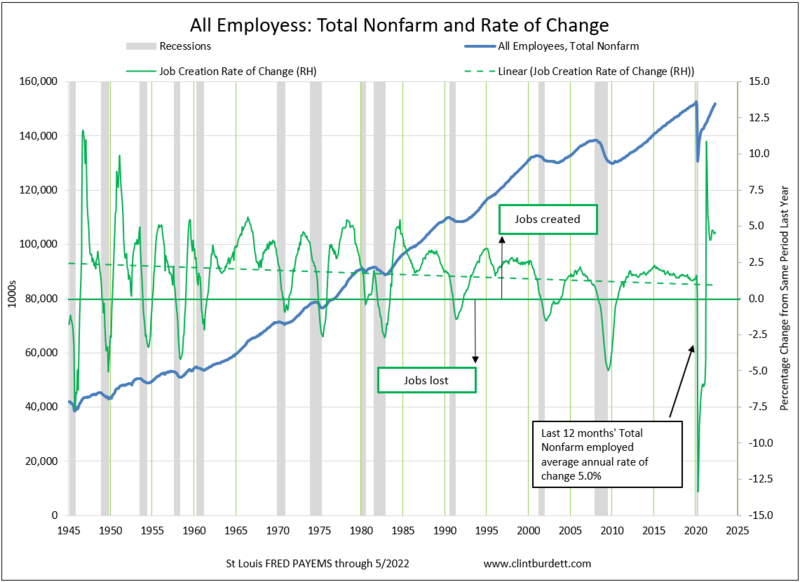 We are at full employment. 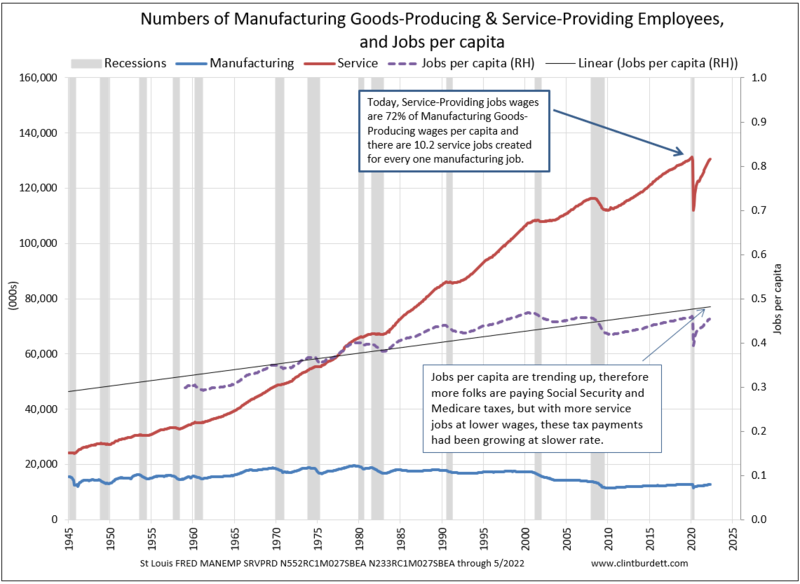 With Manufacturing employees (blue line, little growth) & Service Employees (red line, increasing growth) and Jobs per Capita increasing, which supports Social Security and Medicare taxes, all are increasing since the GenX and Millennials generations larger cohorts are in the work force than the Baby Boomers retire. 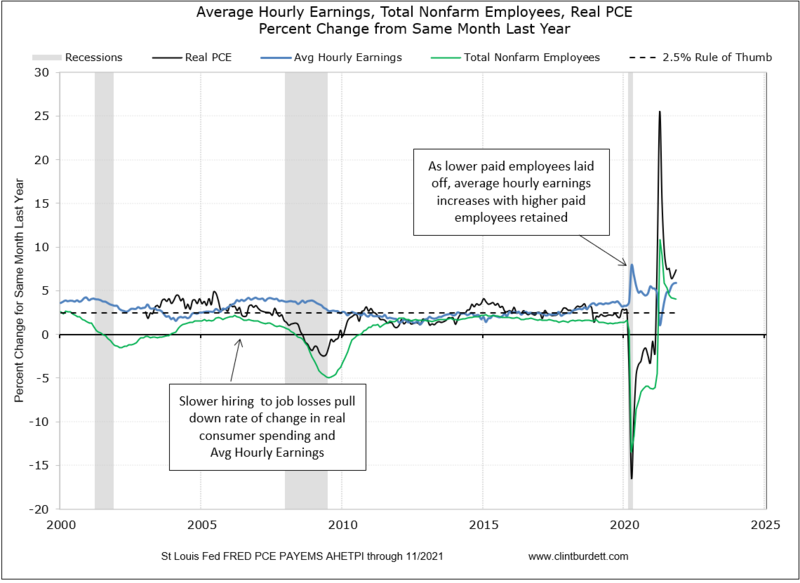 In 2018, wage growth and PCE improved. This sustains the business cycle. Increases in PCE lead to more jobs should lead to better wages with a lag. 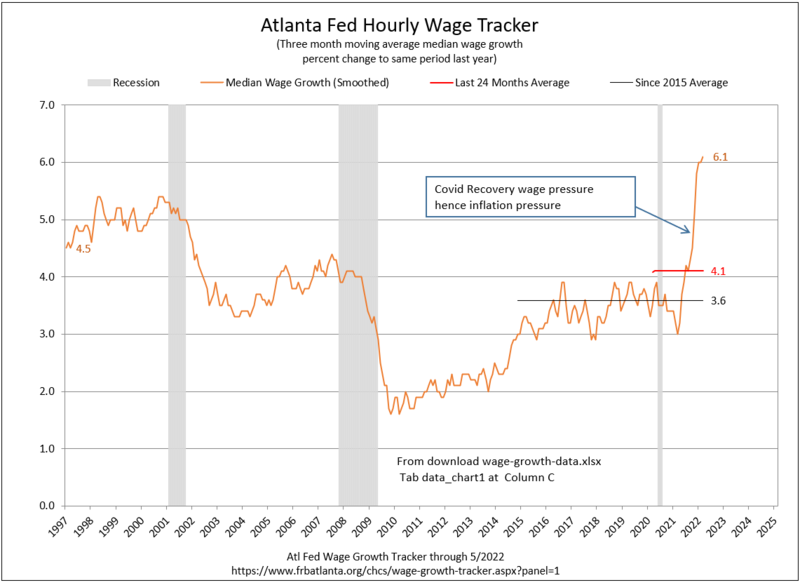 The Atl Fed Median Wage Growth Tracker shows wage growth is trending up as the labor market tightens. Government action to increase income growth: a mixed bag, with a small bump up compared to the same quarter last year from the 2018 tax cuts. Funding lifestyle (PCE) from earnings or savings? Have been saving less to near cash holdings. 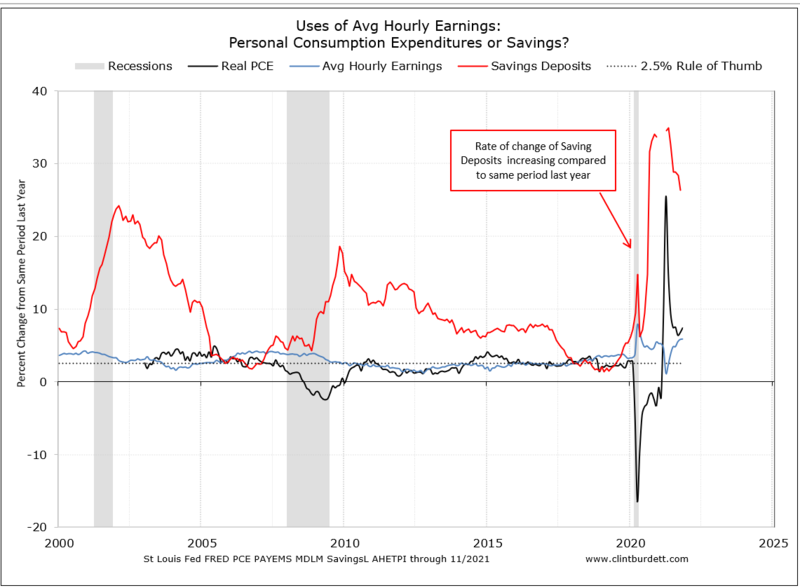 In the second chart, the savings rate is increasing. Real Disposable Income per capita continues to grow modestly. 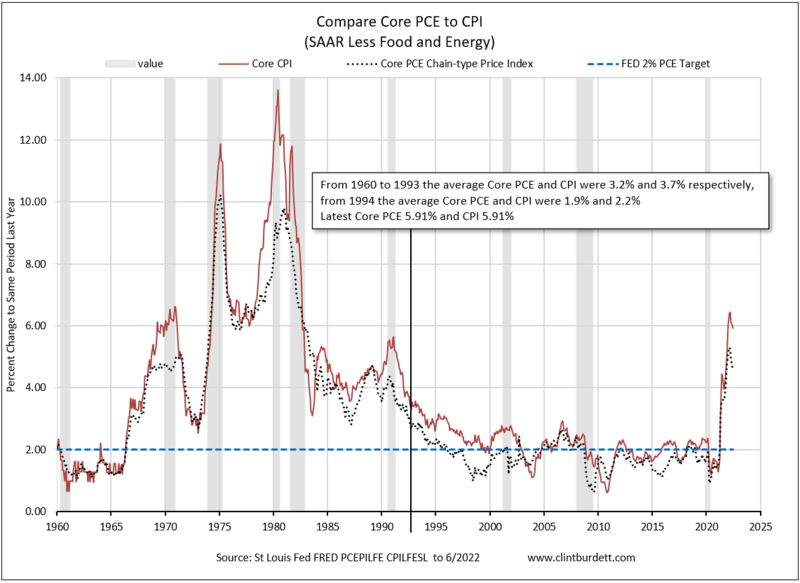 Core Inflation, both core CPI and core PCE Index measures near 2% YoY, the Fed target for core PCE. 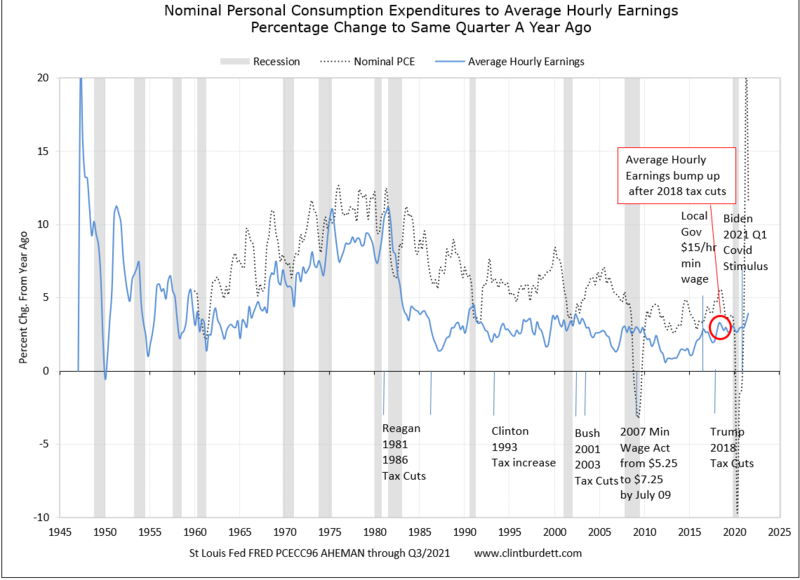 Core PCE (less food and gasoline) and Wage Pressures, where pressure to increase wages is evident of late. 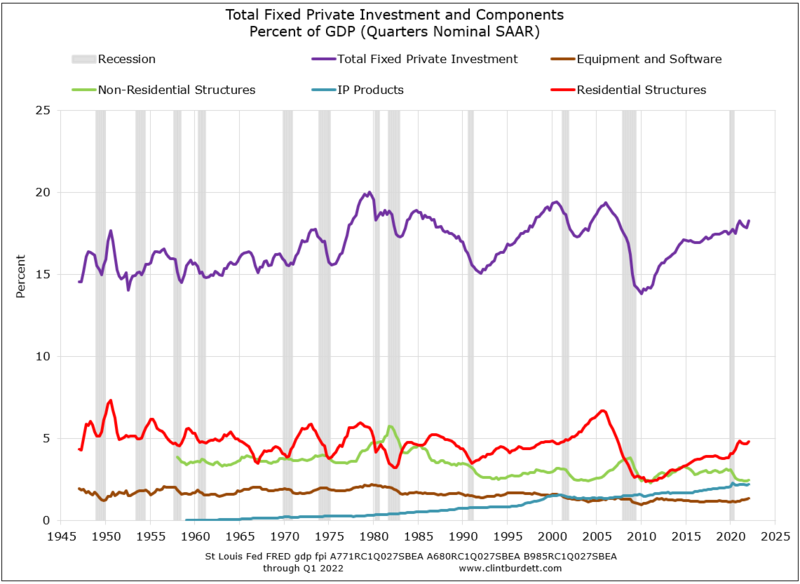 New Homes (Private Residential Fixed Investment - the red line - the classical engine of GDP growth) compared to Total Fixed Investment grew late in the Great Recession recovery, is tailing off now but still improving. See Bill Mcbride, Calculated Risk, for more detail. 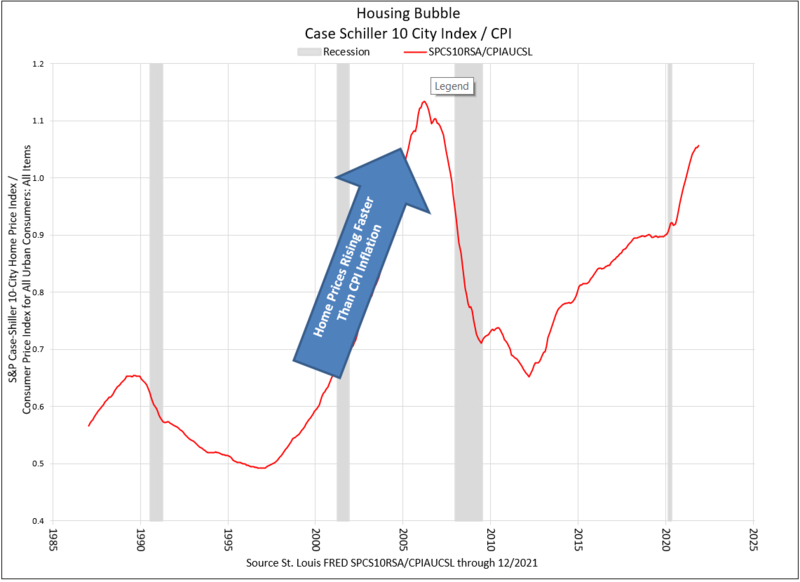 Bill McBride, Calculated Risk on Have New Home Sales Peaked? Home Ownership Rate compared to Rental Property Vacancies move in tandem. Expect home purchases to increase but not approaching the rate before the Great Recession. With the Millennial and GenX generations at the age to purchase a first house, many continue to rent. The Average 30-Year Fixed Rate Mortgage rate is rising compared to last year. 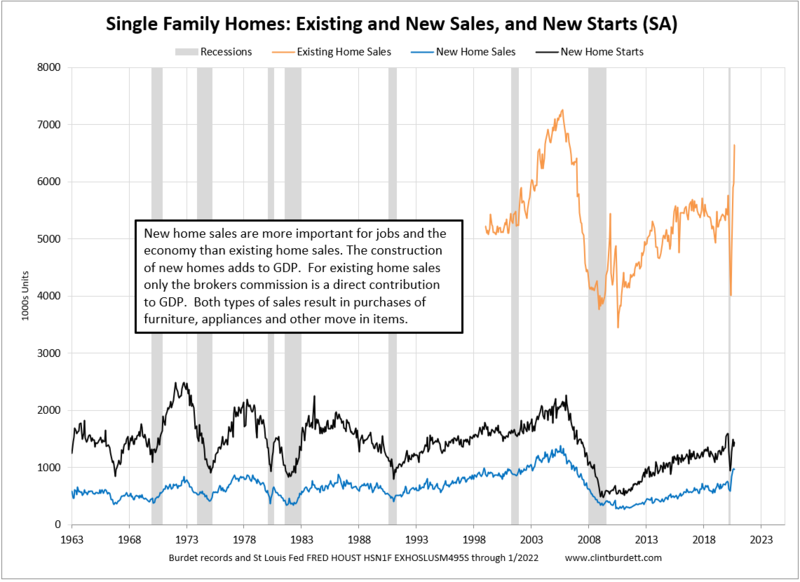 Housing starts, new and existing sales are tailing off in the fall, winter even as mortgage rates moderate, still well below the pre-Great Recession peaks and now picking up early spring. New Homes Starts, Permits and Months of Supply. With more than 6 months supply of new homes for sale and a plenty in the pipeline and permits approved, inventory could increase into 2019. This is a leading indicator for a recession. New Home Median Prices are not affected yet by higher tariffs for materials, more by increasing inventory. House Prices Change Relative to Consumer Price Index. 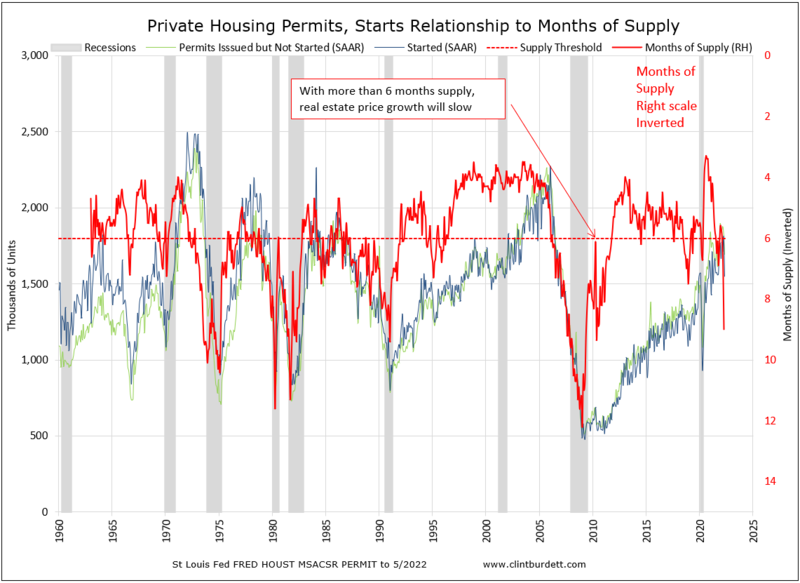 House price increases are more reflective of population growth (more buyers) versus less inventory (months of supply). Improving, more purchases paid with credit card debt. For awhile a good sign for the economy. Swings in Advance Real Retail and Food Services Sales Month to Month are less volatile, though 2018 fall sales decreased YoY. The Percentage Change for Retail Sales to Same Month Last Year is trending down. 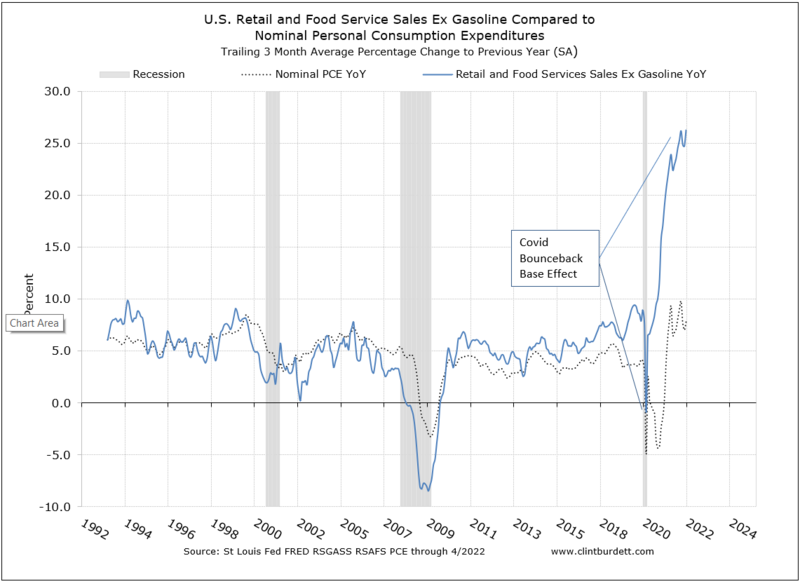 Retail and Food Service Sales ex Gasoline compared to Nominal PCE trending down since the fall. I define risk as uncertainty about my mid and long-term finances. Risk is increasing when I focus more/mostly on my short term planning horizon (12 month cash needs). Risk is decreasing if my horizon is more near or mid term (2 to 5 years - balancing my portfolio or starting a big project) and long term (5 - an investment to sustain my life style to 30 years - a mortgage). A proxy for uncertainty is the market for Treasury securities market (purchases, sales and interest rate spreads) of these safe investments - United States Treasury debt with terms from 3 months to 30 years. Yields on Federal constant maturity securities are converging, which means investors have a short term viewpoint - risk in increasing. 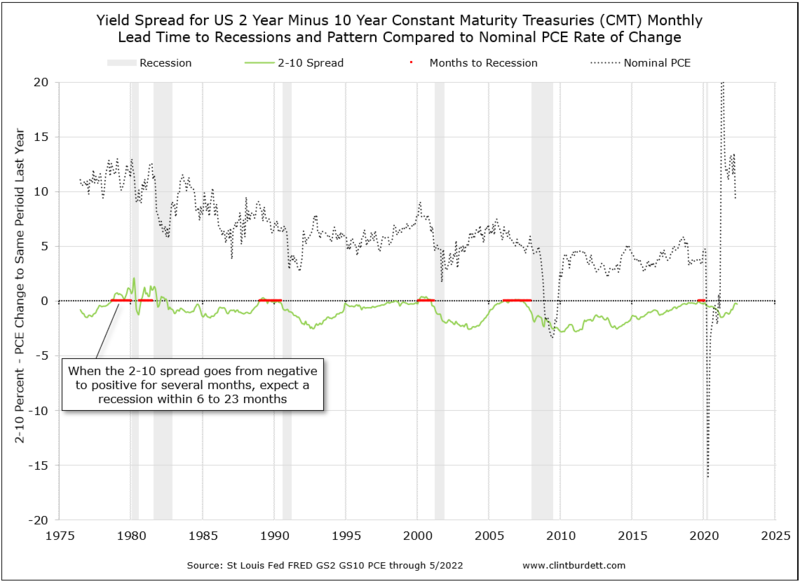 This bodes poorly for next year and after the 2 Year - 10 Year CMT spread is positive, short term interest is greater than long term interest, and since WWII a recession will follow in about 11 to 24 months. 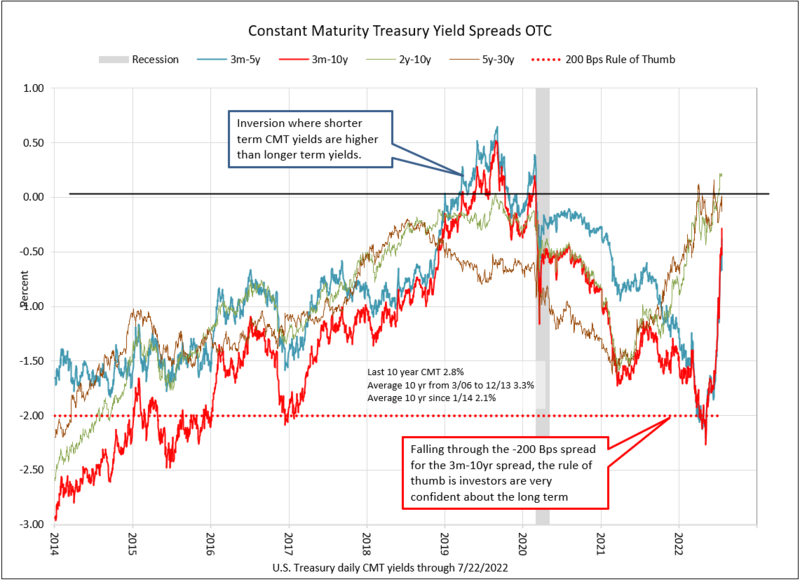 The classic yield curve, 2yr - 10yr CMT, is flattening (the spread approaching 0). 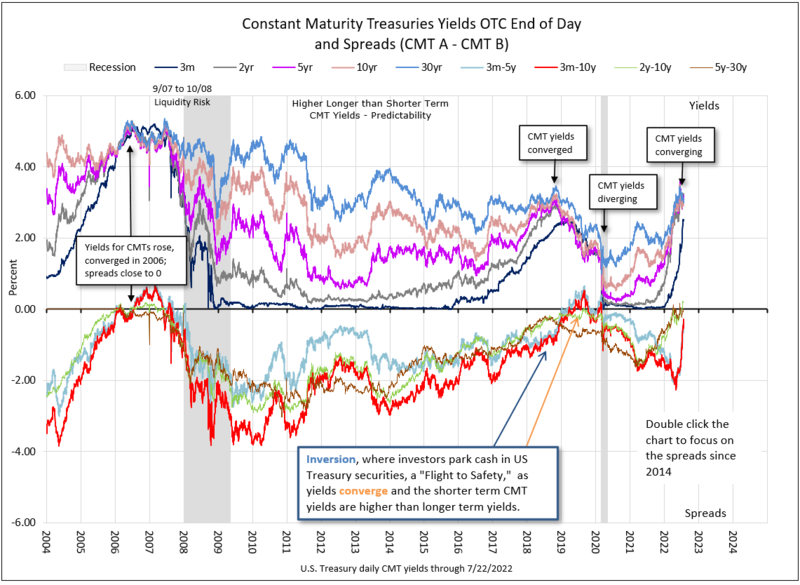 When 2yr CMT interest is greater than 10yr's, the curve curve has inverted, short term rates are higher than long term rates, and usually a recession follows, more later. The San Francisco Fed considers the 3m T Bill to 10 Year Note spread a slightly better leading indicator of a recession. The financial press often report the 10 - 2 spread, but I do the opposite, 2 - 10, so I can show the spread's relationship to nominal PCE (fixed securities buyers factor in inflation so I use nominal PCE). Constant Maturity Treasury 3 Month and 2,5,10 and 30 Year interest rates are converging. The 3m T-bill to 5 Year T-Note and 3m to 10 year spreads have inverted mid-March. 3 month Treasury Bill to 5 Year Constant Maturity Treasury (CMT) Note - at what interest rate yield do I park cash up to five years, the planning horizon for large project. The market is demanding more interest for short term parking of cash though inflation is modest, this yield spread has inverted. Capex may slow down as projects are postponed as lenders tighten their belts. 3 month Treasury Bill to 10 Year CMT - at what interest rate yield do I park money for 3 months compared to a safe cash flow investment for 10 years. 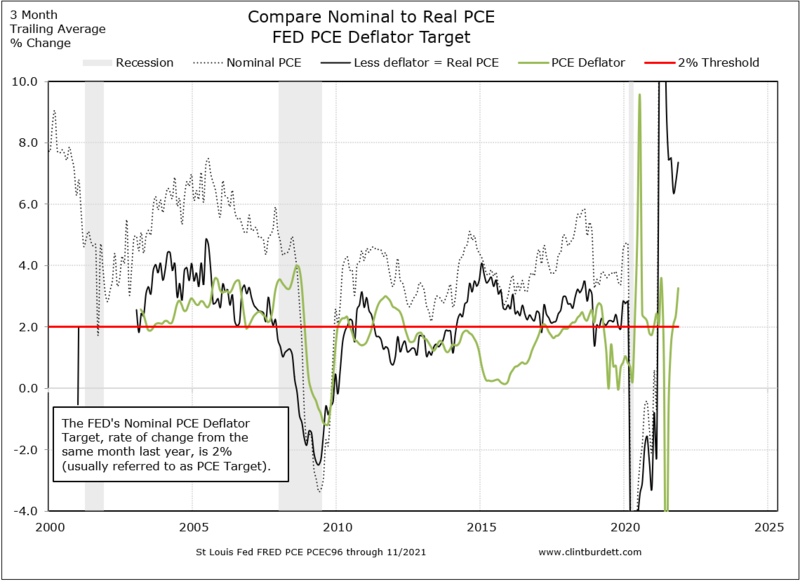 The market is demanding more interest for short term parking of cash expecting a slow down near term (Real PCE growth YoY is trending down). This yield spread inverted March 22, 2019. 2 Year to 10 Year CMT Notes - the financial media compare the FED's the stance of monetary policy, i.e., FOMC rate changes, to bond market investors' long-term expectations. The Fed is dovish, accommodative (no near term rate hikes or cuts) so bond investors have still can demand a little more interest for 10 year notes. 5 Year CMT Note to 30 Year Bond - at what interest rate premium does the US Government borrow mid-term compared versus long term. 3/22, the 30 Bond Rate is 2.88%, well below its 3.62% average since 2/2006, but trending up compared to the 5 year rate. 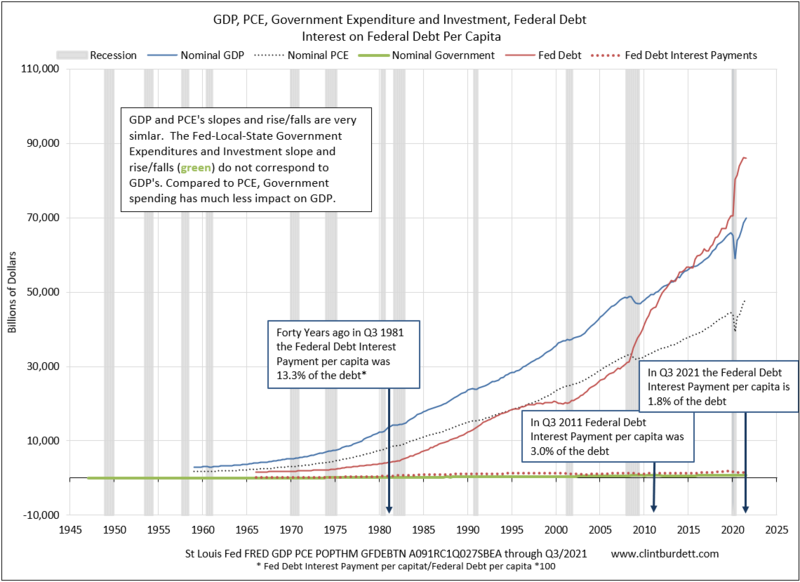 Federal debt is getting more expensive. Overall, the bond market is anticipating a slow down or recession in the near to mid term. At university, I was taught that bond investors, a conservative lot, anticipate future economic growth peaks or troughs looking for the "coffee cup." In a recession, longer term yields come down to attract buyers, the handle. After a recession, Real GDP growth peaks as spending accelerates (left side of the cup), settles down (the bottom of the cup) and then peaks again (the right side of the cup) before onset of the next recession. 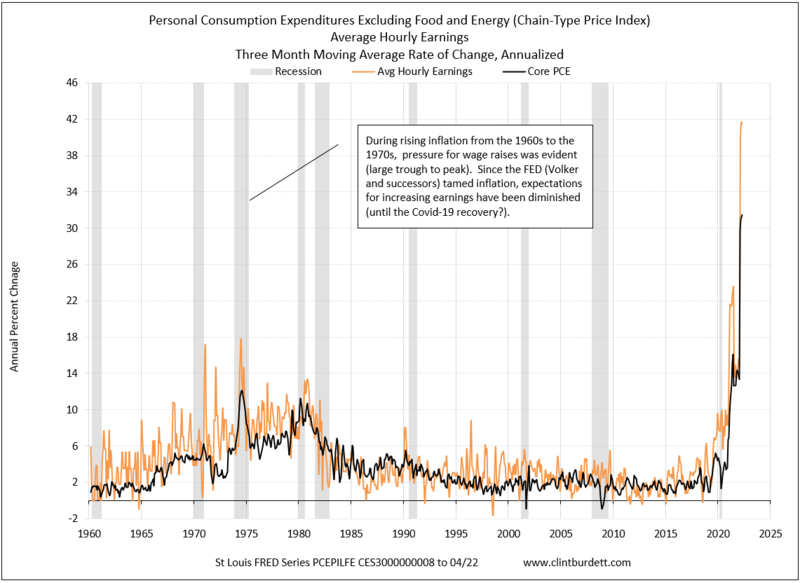 People often say as the right side forms, the economy is "heating up," evidenced by inflation as fixed security yields rise. Observing for the cup is an assessment technique. I think we are coming off the peak on the right side of the cup. Unlike previous recession onsets, there is little talk of the economy heating up due to inflation. not protected by a copyright. or FRED page for the source and any restricted use. All graphs indicate the data sources.